The wreck of the Selma. Photo by Ralph Glidden from his Nov 1915 – March 1916 expedition. Courtesy of the Santa Catalina Island Museum. 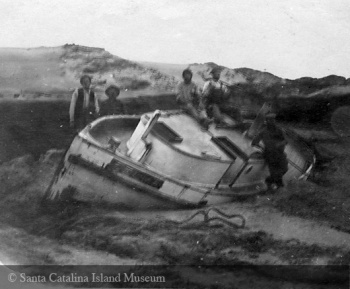 Selma (#) (-1916), 32-foot fishing boat which was wrecked on San Nicolas Island on January 8, 1916. Of the two lobster fishermen aboard, Henry Geberbauer was drowned and Charles Eckhart survived. This page was last edited on 25 January 2016, at 19:56.